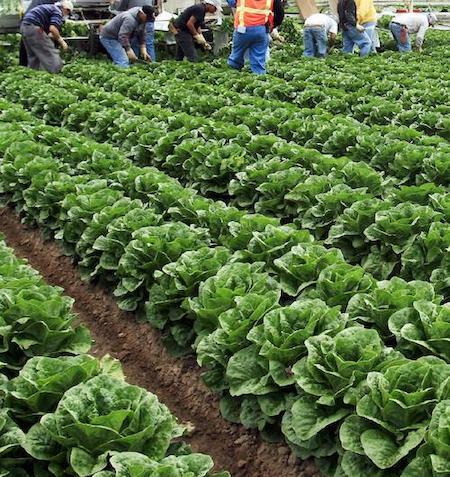 ChainLink Research : Research :Romaine Remains: Will the Romaine Lettuce E. coli Outbreak Hasten or Hinder Traceability In Produce Supply Chains? Romaine Remains: Will the Romaine Lettuce E. coli Outbreak Hasten or Hinder Traceability In Produce Supply Chains? As the saying goes, "never let a good crisis go to waste." Ironically, the industry's response to the recent crises of E. coli contamination of romaine lettuce may delay rather than speed up implementation of traceability across produce supply chains. When there is a recall in the produce supply chain, usually the entire industry suffers, not just the culpable party (or parties) that were the source of contamination. This is due to the inability, in most cases, to rapidly identify the contamination source and notify consumers, with high confidence, exactly which products are safe and which are contaminated. As a result, all of that specific variety of produce is suspect, regardless of the source. Often all of that variety throughout the supply chain ends up going to waste. The effect can linger for months, as cautious consumers are slow to start eating their spinach or romaine lettuce or strawberries, even after the ‘all clear’ has been given by authorities. This can result in millions of dollars of lost revenue and wasted resources (including the growing, refrigerating, transporting, and storing of the produce before it was ultimately discarded). Pain of Recalls Not Enough Yet? You would think that would be enough to drive the industry to implement industry-wide traceability to solve the problem. Not yet. California growers have made strides through monthly water testing protocols, but it has proven to be insufficient. In spite of many voices, industry consortiums, and resources dedicated to the effort, the industry has not yet adopted ubiquitous end-to-end, network-accessible traceability. Isn’t Traceability Already Mandated by Regulation? The CDC has made progress in diagnostic capabilities using DNA fingerprint analysis1 to correlate different outbreaks across the country. And yes, there are already regulations in place2 mandating traceability recordkeeping for produce supply chain participants. These requirements are intended to provide the data needed to enable forward and backward traceability. In theory, government agencies, working with industry, can use those records to trace back through the produce supply chain to identify the sources of contamination and then trace forward to see where the tainted batches of product went. In practice, those systems often rely on paper-based records or other manual systems, resulting in painfully slow gathering of data that is sometimes inaccurate or incomplete. This impedes investigators’ ability to rapidly trace back to the source … or once the source is found, rapidly trace forward to all the places that contaminated produce has gone. As a result, when there is an outbreak, rather than being able to do a surgically precise recall, the entire industry can be impacted. The recent outbreak of E. coli-contaminated romaine lettuce is only the latest in a long line of outbreaks. Here are just a couple examples: In 2006, spinach tainted with E. coli O157:H7 resulted in three deaths out of 200 people who got sick, 102 who were hospitalized, with 31 developing hemolytic-uremic syndrome (HUS), a type of kidney failure. Eventually, epidemiologists from the FDA, CDC, and the State of California found the source at a farm in California.3 It is estimated this outbreak cost the industry about $12M. In 2013, a multistate outbreak of infections of Shiga toxin-producing E. coli O121 was linked to Farm Rich brand frozen food products. There were no deaths, but 35 people got sick, 9 were hospitalized, and two developed hemolytic uremic syndrome (HUS). Similarly in 2017, a multistate outbreak of Shiga toxin-producing E. coli O157:H7 was traced back to I.M. Healthy Brand SoyNut Butter, resulting in 12 hospitalizations. Before the current outbreak, there were two other significant outbreaks of E. coli O157:H7 from romaine lettuce in the winter and the spring of this year. The latter resulted in 210 illnesses, 96 hospitalizations, and five deaths. Perhaps because of the severity of that recent outbreak, the CDC appeared to act initially with an abundance of caution on the recent ongoing romaine outbreak. On November 20th, the CDC issued an alert, advising consumers, restaurants, and retailers not to eat, serve, or sell any romaine lettuce, while it was investigating an E. coli O157:H7 outbreak. 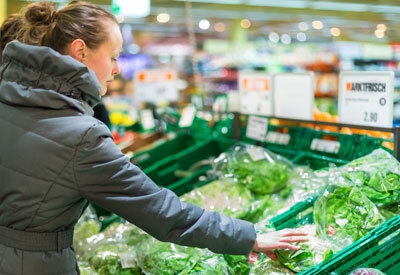 Advocates of true end-to-end traceability in the produce supply chain may have been hopeful (or at least wishful) that maybe this time the industry will suffer enough financial pain to finally spur them to invest in true end-to-end traceability. The industry’s near-term response has been to agree to labeling on each package of romaine lettuce, indicating the date and region that it was harvested in. The FDA’s traceback analysis has narrowed the source of this outbreak to six counties in the Central Costal growing region of California. On November 26th, the CDC announced that romaine lettuce labeled with a harvest region outside of those six counties should be safe to eat. This method should work (in theory) when the source of contamination has been narrowed down. It remains to be seen how well this will work in practice for this outbreak. This approach leaves challenges when contamination occurs further downstream in the supply chain, such as at a food processing plant. Traceability Postponed … or Blockchain to the Rescue? Both Walmart and IBM are trying to apply lessons learned from previous attempts to require supplier participation—such as Walmart’s ultimately abandoned 2003-2005 attempt to mandate that suppliers tag all inbound cases with RFID tags. IBM and Walmart are trying to have low or no costs for suppliers, with simple onboarding, self-service education, and benefits for suppliers to convince them to get onboard and participate. Furthermore, IBM told us they designed Food Trust with the assumption that they will not be the only traceability network in the produce supply chain. They said the system is architected to interoperate with other traceability networks and systems, in order to obtain a complete picture of what is going on across the supply chain for their clients. It is good to see someone realize that a network of networks is more valuable and realistic than trying to dominate the industry alone. So, we maintain some healthy skepticism, based on the industry’s repeated reluctance to embrace traceability networks (especially the long tail of smaller suppliers), but there is some room for cautious optimism. We may yet see end-to-end traceability in our lifetime. 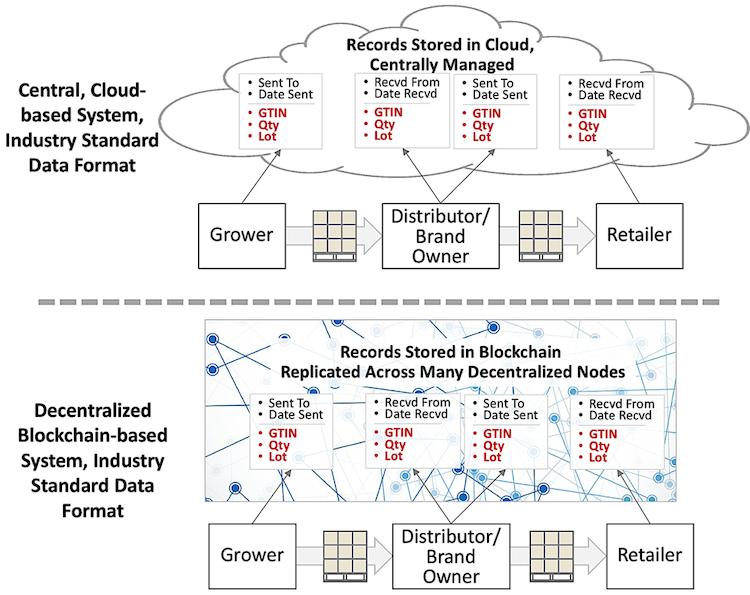 If you are interested, the remainder of this article drills down on the difference between 1-up/1-back traceability and end-to-end traceability, regulatory drivers, and the role of blockchain and Network SaaS systems. The remainder of this article is excerpted from Blockchain's Role in the Produce Supply Chain. Traceability is fundamental to achieving rapid and robust recall capabilities. Upstream traceability (aka backwards traceability) is the ability to trace an item5 back to its original source. Downstream or forward traceability is the ability to start atthe source or any intermediate point and find out where each end item from any particular batch ended up. A traceability system should provide both upstream/backwards and downstream/forward traceability. 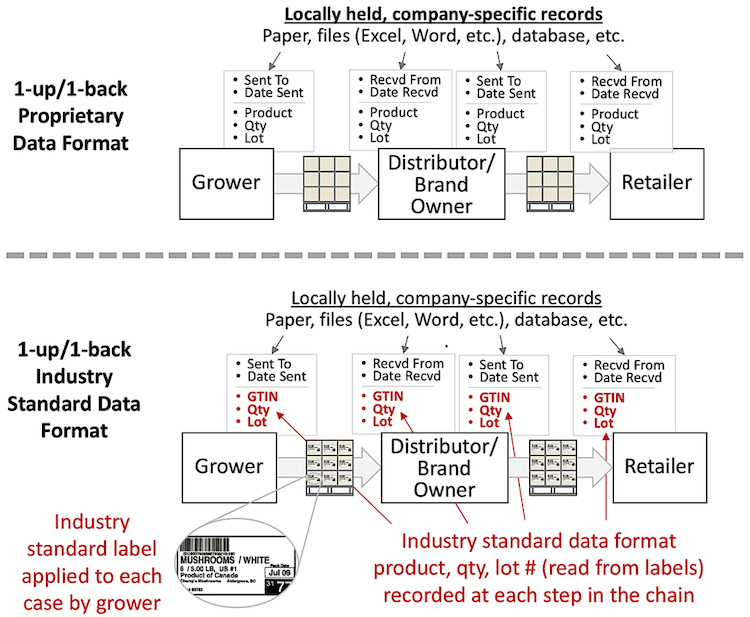 The most widely used approach to traceability in the food supply chain is one-up/one-back traceability (aka 1-up/1-down), where each participant in the end-to-end chain (grower, processing plants, distribution centers, retailer, etc.) keeps track of where every item (or batch of items) they received came from, and where each item (or batch or lot) is sent to. One-up/one-down food traceability is mandated in the United States by Section 306 of the 2002 Bioterrorism Act. If everyone in the chain does 1-up/1-down traceability record keeping properly, then when a problem occurs, such as a batch of food is contaminated, the problem can be traced back to the source of contamination anywhere in the chain. Contamination can happen at different points in the chain, not just at the origin. When contaminated food is discovered (either by testing or when people get sick), backwards traceability can help find the convergence point; the common location that all of the contaminated food came through. Then authorities and the operator of that farm or facility can diagnose the problem further, identifying the exact source, such as an improperly sanitized shredding machine in a processing plant. Once the source of contamination has been identified and rectified, forward traceability can be used to identify where all the tainted items ended up. In practice however, much of the industry uses paper or manual systems, so the actual traceback process is very slow and fraught with error.6 In fact, this inadequacy was a key impetus for including traceability in the 2010 Food Safety Modernization Act (FSMA). Transform/process—e.g. clean, shred, bag. These will have two separate set of records: one for the inputs and another for the outputs. Data such as the items shipped/received, quantities, and lot numbers are to be recorded for each event. With this data, produce can be tracked at each step from origin to final consumption or disposal. The FSMA specifically does not say what technology to use and only mandates 1-up/1-back traceability. When contamination events occur, this leaves government agencies and agents with the work of contacting each party in the chain to request their 1-up or 1-back trace information, in order to stitch together an end-to-end picture. Companies have 24 hours to respond to such requests. The FSMA pilot report encourages the use of industry standards, which makes it easier to correlate the various records received from the different parties in the end-to-end chain. Traceability standards have been developed by GS1 working with PTI (Product Traceability Initiative). The standards focus on the item, quantity, lot/batch/serial #, harvest date (lot and harvest are optional). This data is put on a standardized label on each item, case, and/or pallet. Figure 1 below shows the 1-up/1-back approach using proprietary data and using industry standard data. While not mandated by regulations, a networked cloud-based (aka SaaS) system provides a far better solution than 1-up/1-back. First, it is important to distinguish between Enterprise SaaS vs. Networked SaaS architectures. Both have a shared code model (run in a single multi-tenant instance), but the enterprise SaaS model lacks a shared data model, where things like supply chain events can be written and shared across a network of trading partners.7 In a networked SaaS system, the chain-of-custody data (hand-offs of batches or individual items from one party to the next) are recorded in a shared networked database, instantly accessible to authorized parties. This makes the trace-back and trace-forward processes virtually instantaneous. End-to-end tracing that used to take days or weeks can now be done in a couple of seconds. A blockchain architecture can bring similar network-wide data-sharing benefits. Figure 2 above illustrates the difference between a cloud-based vs. blockchain-based approach. In the cloud-based approach, a single central authority controls the system. The nodes may be physically distributed (and often are, to increase robustness and availability), but control is centralized. In contrast, control of the blockchain nodes is decentralized, allowing many parties to participate in ongoing verification and validation of the data. The blockchain architecture makes it much harder for someone to change data after the fact.